Reiki is the Japanese word for the universal life force energy that surrounds and flows through us. This energy travels via certain pathways in the body that can become blocked or weakened. When we find ourselves “out of balance” due to stress, illness, or a lack of energy, a Reiki treatment recharges, aligns, and harmonizes the body. 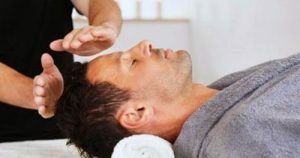 Reiki is a safe technique that helps reduce stress, stimulate the immune system and relieve pain and symptoms of health conditions. A Reiki session is usually between 60 and 90 minutes with the client fully clothed and lying on a massage table. The Reiki practitioner places their hands lightly on or above the client using specific Reiki hand positions. The hands are placed over organs, endocrine glands or chakra centers beginning at the crown of the head and moving towards the feet. The hands stay stationary for several minutes to allow the transfer of energy and the healing process to take place. The client usually turns over once during the session. At the end of the treatment there is a feeling of well-being. Reiki’s gentle energy has been a safe and natural method of spiritual healing and self-improvement for over 2500 years. The treatment has little to no side effects. Some clients report tingling or sensations of heat or cold during the session. After the session there can be a sense of calmness, greater awareness, feeling present and a balance to the whole body, mind and spirit. To experience the benefits of a Reiki session first-hand call Therapeutic Kneads to book your appointment with Gayle, who is a certified Reiki practitioner, to make your appointment for a 30 or 60 minute session or add 15 minutes to complement your 60 minute massage therapy treatment.